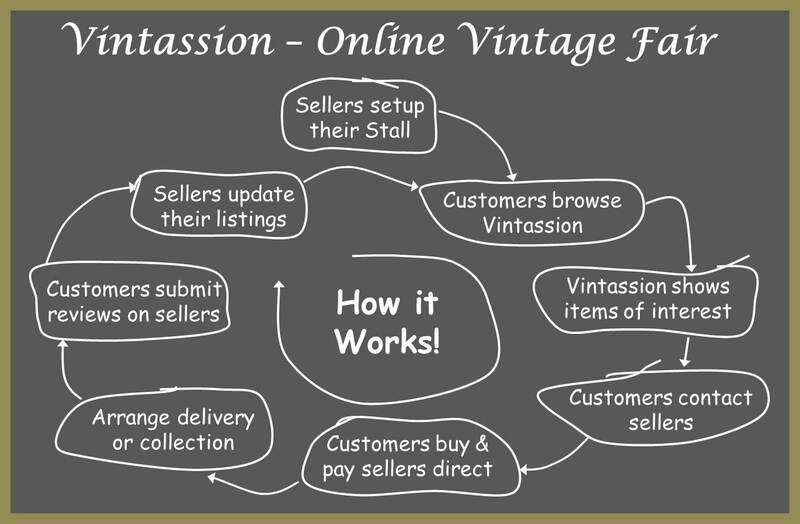 Online Vintage Fair How It Works! 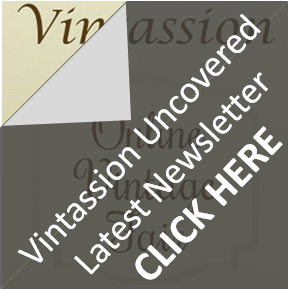 VINTASSION is an online vintage fair dedicated to helping everyone with a pASSION for VINTage in buying and selling all types of Vintage, Retro, Upcycled & Handcrafted, both Online & with the #1 VINTAGE EVENTS FINDER. What makes Vintassion especially interesting is that every seller has the opportunity to list their best items, in fact up to 100 items and sellers may also restock their stall as they sell. Plus Vintassion Sellers can show if they wish weblinks to any other sites they sell e.g. asos, etsy, ebay, facebook and their own website. You therefore get the opportunity to easily compare and find the “best of the best” vintage, retro, upcycled and handcrafted from an interesting and wide variety of online stalls. This is helped by all item listings being presented in a similar easy to compare format, including: payment options, seller policies (e.g. returns policy), and delivery options. You may also share items you love easily with friends using the social media links for Twitter, Facebook, Pinterest etc. Like a Vintage Fair Customers purchase items direct from Sellers in accordance with their Policies (Terms & Conditions) including, Terms of Sale, Returns Policy and Delivery Policy. Sellers may be based in the UK or overseas and typically offer a range of payment options including a buy now "PayPal Click Here To Buy" button, which enables Customers to click and pay the Seller of an item securely via PayPal using their credit or debit card, bank account or direct from their PayPal account if they have one. If you wish to find out more information before making a purchase or purchase more than one item from a seller, you may send a buy enquiry message to the Seller by clicking the "Contact" button on the item listing, or send a general enquiry message by clicking the "Contact" button at the top of a seller's stall. Please note none of the items listed on Vintassion are offered under an auction bid type of sale, although you’ll see items marked or best offer indicating Sellers are open to best offers, which you may send them by clicking the "Contact" button on the item listing. If after browsing the fair you can’t find what you are looking for, please send us a Help me find it message, which we’ll pass on to our sellers who will aim to reply by email before the end of the next day if they can help. To further help you decide to buy from a particular seller's stall take look at their customer review star ratings. A seller’s overall customer review star rating is the average of their last 50 customers' reviews. After you’ve bought an item you will be invited to submit a review about how well the item as described met your expectations and your experience of buying from the seller. You can also search the A-Z of Stall Holders, which lists all the sellers and their review ratings, and you may simply select and open any stall of interest. When you fancy going to a Vintage Fair then take a peek at the #1 VINTAGE EVENTS FINDER page for details of fab fairs across the UK and Ireland, and easily share their details with friends using the social buttons. You can also see if there are any Vintassion sellers planning to trade at one or more of these events and browse their online stall in advance, and maybe reserve an item or two for collection at an upcoming fair! For more information on Vintassion please take a look at our Frequently Asked Questions and the helpful links at the bottom of every page such as: Contact Vintassion, Terms and Conditions, and Social media links. If you are also interested in trying the Vintassion Sellers' no tie-in 30 day free trial and opening your own online stall please click here.